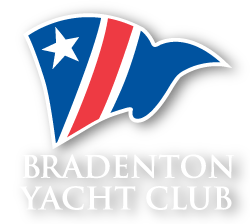 The Bradenton Yacht Club offers elegant as well as casual dining in its spacious formal dining room and adjacent burgee room. There is a full bar that overlooks the scenic Manatee River. There are also an additional Palm Room, River Room and Commodore's Room that are perfect for meetings or small parties. The club has a 52-slip basin for members' boats and a 185’ Transient Dock with 30 and 50 amp service for Members and FCYC Visitors along the Governors Cut which connects Terra Ceia Bay to the Manatee River. The heated and cooled Swimming Pool, Pool Bar and Tiki Bar are situated along the Cut as well. Fuel and pump-out facilities are available along with a boat launching ramp. Overnight guests have access to restrooms and showers, complimentary ice, cable TV, Wi-Fi connection and morning newspaper. There are also bicycles to explore Snead Island and nearby Emerson Point Park. In addition, a grilling area with screened-in outdoor dining as well as two lighted tennis courts are available on the grounds for members and visitors.